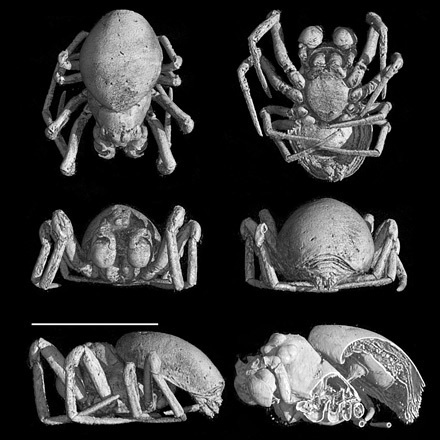 A 53-million-year-old spider has been revealed in exquisite detail by scientists from the UK and Belgium. The spider Cenotextricella simoni is about 1mm in length (see scale-bar). The scientists say that it would have inhabited a wooded area and lived in a warm climate. Internal details can be seen in the view at bottom-right. The ancient creepy-crawly had been trapped in amber and preserved in a lowland area around Paris, France. The scientists reconstructed the creature’s original appearance using an X-ray-based medical imaging technique. The pictures, published in the journal Zootaxa, “digitally dissect” the tiny spider to expose amazing details such as the preservation of internal organs. “This is definitely the way forward for the study of amber fossils,” said David Penney, from Manchester University and lead author on the study. This is the first time that the medical imaging technique, known as Very High Resolution X-Ray Computed Tomography, has been used to investigate a fossil in amber – and Dr Penney said it had the potential to “revolutionise” the way fossils were studied. 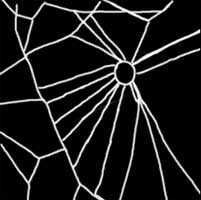 In the 1960s, Dr. Peter Witt gave spiders various kinds of drugs and alcohol to observe the effects on their webs. The results were pretty interesting. 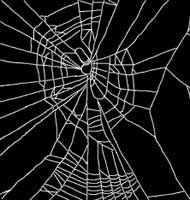 In 1995, NASA scientists seeking to measure toxicity relationships examined the webs of spiders dosed with various chemicals. Their experiments have shown that common house spiders spin their webs in different ways according to the psychotropic drug they have been given. 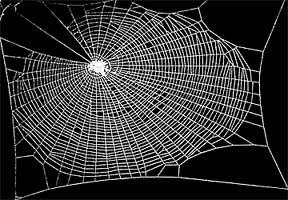 Nasa scientists believe the research demonstrates that web-spinning spiders can be used to test drugs because the more toxic the chemical, the more deformed was the web. * Those on Benzedrine – “speed” – spin their webs “with great gusto, but apparently without much planning leaving large holes”, according to New Scientist magazine. 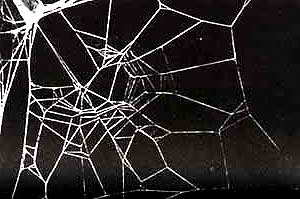 * Spiders on marijuana made a reasonable stab at spinning webs but appeared to lose concentration about half-way through. 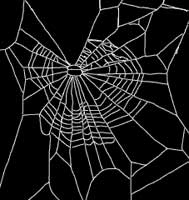 * Caffeine, one of the most common drugs consumed by Britons in soft drinks, tea and coffee, makes spiders incapable of spinning anything better than a few threads strung together at random. * On chloral hydrat, an ingredient of sleeping pills, spiders “drop off before they even get started”. You are currently browsing the archives for the Arachnology category.